Rosa Parks may be lionized for her defiance on the bus, but that episode doesn’t do justice to her career as an organizer. Black History Month just ended, which means grade schools nationwide recently celebrated how the Civil War abolished slavery, that George Washington Carver invented peanut butter, and, of course, how the Civil Rights Movement ended segregation and disfranchisement. Children everywhere rehearsed familiar narratives about how after enduring years of racist oppression, valiant African-American women and men like Rosa Parks and Martin Luther King Jr peacefully demanded and secured equal rights. And in a bizarre reminder of the political significance the struggle for civil rights still carries, Barack Obama and John Boehner capped the month with a rare joint appearance to unveil a statue of Parks in the Capitol building on the same day that the Supreme Court heard a challenge to the Voting Rights Act of 1965. We can expect a ruling a few months before we celebrate the fiftieth anniversary of the March on Washington for Jobs and Freedom, where, on August 28, 1963, King delivered his renowned “I Have a Dream” speech. The big story hardly needs retelling. After refusing to give up her seat at the front of a Montgomery bus to a white man – and thus disobeying a municipal ordinance requiring blacks to stand so whites could sit – Parks was arrested, an action that sparked the city’s 1955 bus boycott, which introduced King to the world. The statue, predictably, is modeled off the classic photograph of Parks seated on the bus with her pensive gaze cast out the window. But that the photograph was staged speaks volumes. Parks may be lionized for her defiance on the bus, but that episode doesn’t begin to do justice to her remarkable career as an organizer. As Brooklyn College political scientist Jeanne Theoharis notes in her recent biography, The Rebellious Life of Mrs. Rosa Parks , “One of the greatest distortions of the Parks fable has been the ways it missed her lifetime of progressive politics.” Another great distortion is the extent to which it ignores the collective nature of Parks’s ostensibly individual action. At the time of her arrest, Rosa Parks was Secretary of the Montgomery local of the NAACP, a branch that had deep roots in the city’s trade union movement. A few years earlier, as an advisor to the local’s Youth Council, she helped young African Americans organize a campaign to borrow books from whites-only libraries. And just months before the boycott she spent time at the Highlander Folk School – a legendary leftist organizing academy supported by and influential in the growth of the CIO – as part of a program on how to organize in the climate fostered by the Supreme Court’s 1954 Brown v. Board of Education decision. Suffice it to say she was no novice when she held her ground on the bus. Moreover, her action wasn’t spontaneous but was planned in conjunction with the NAACP and area trade unions. Meeting her at the jail with bail money was E. D. Nixon, president of both the city’s NAACP chapter and the Montgomery local of the Brotherhood of Sleeping Car Porters (BSCP). Nixon also recruited the twenty-six-year-old newcomer to Montgomery, King, to speak in support of the boycott. In 1935, the BSCP, under the leadership of A. Philip Randolph, became the first African-American-led union to join the AFL after a grueling but ultimately victorious ten year campaign to organize sleeping car porters for the Pullman Company. At the time, the Pullman Company was one of the largest private employers of African Americans in the country. It was also the company that the American Railway Union, whose leadership included Eugene Debs, waged an unsuccessful national strike against in 1894, one of the more famous struggles in the late nineteenth century graveyard of labor strife. Randolph himself was among the most important – and most often forgotten – civil rights leaders. For years he challenged the mainstream African-American advocacy organizations to support trade union struggles, a step to which they were initially cool (understandably, given the AFL’s history of racial exclusivity). In the early 1940s he spearheaded the March on Washington Movement, the predecessor to the demonstration two decades later, which pushed Franklin Roosevelt to sign an executive order desegregating defense production industries. And he was instrumental in orchestrating the 1963 march that drew a quarter million people to the National Mall demanding federal civil rights legislation. Indeed, while Randolph’s accomplishments are too numerous to document here, it’s without question that the Civil Rights Movement as we know it wouldn’t have occurred without him. Second, and just as significant, it’s a reminder of how important a labor movement is to serious progressive politics. 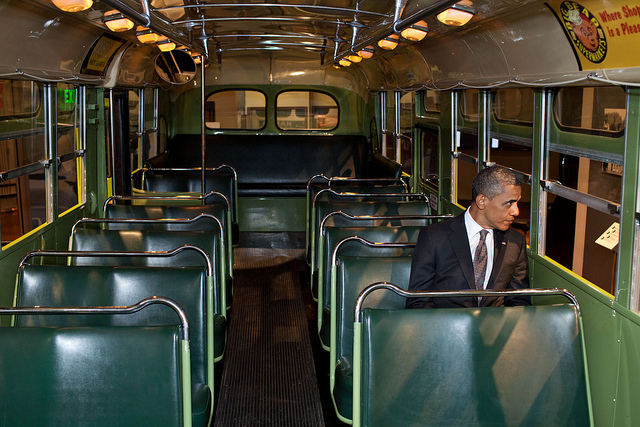 Parks’ action, the bus boycott it initiated, and the prominence to which it catapulted King, not to mention all the tireless and thankless work innumerable activists devoted to building the movement, wouldn’t have been possible without organizational and material support from unionized workers. That King was assassinated on a trip to Memphis in support of striking sanitation workers is a poignant reminder of how entwined the two movements were. Rustin’s point was that while the movement had dismantled de jure segregation, most African Americans continued to face economic problems and, consequently, that those fundamentally working-class concerns needed to be the next target. If we in the twenty-first century are serious about challenging inequality, both economic and racial, we need to start thinking the same way. Samir Sonti is a graduate student in history at UC Santa Barbara.